AccountSwappers is proud to offer Empyrean Weapon Upgrade services. Our service is designed to be 100% safe. FFXI Services from Accountswappers do require your login and password, we are able to accommodate customers on Asura. 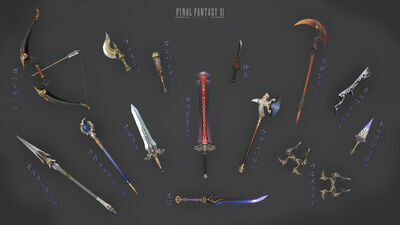 Empyrean Weapons are the staple of Final Fantasy (FFXI) in todays game. The most damaging weapons you can obtain. The upgrade items for stages 80, 85, 90 are extremely boring and tiresome to farm yourself. Let the experts at AccountSwappers get you past these stages quickly and safely. All +2 Armor upgrade items are free. Contact us today to for details! Completion time varies based on load and weapon/stages. We offer discounts for multiple weapons and stages. To purchase services please email directly neoex@accountswappers.com. Yes we offer custom plans and discounts for multiple weapons as well!